Ladies statement watch highly reflective and bold links shaped as a chain link with a concealed safety clasp . The watch will have a two year warranty and the bracelet and case have been ultrasonically cleaned . 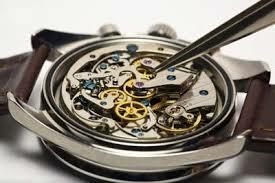 Swiss made movement which we have fitted a new swiss made battery . Timed and tested with good accuracy take from the testing procedure we adhere to .